Baltic Sotheby’s International Realtyoffers wide range of services, representing extraordinary properties in Latvia, Baltic countries and globally, cooperating withSotheby’s International Realty® affiliates in Europe, USA, Latin American and Asian countries. The wide scope of Baltic Sotheby`s International Realtyclients and partners includes Sotheby`s Auction House, Private Banking and foreign embassies. Leading luxury real estate brand Sotheby’s International Realty® is founded in year 1976. Reputation that has been created during centuries by the London auction house is continued with Sotheby’s International Realty®network providing an excellent service and the tradition of representing worlds` most sophisticated, beautiful and unique properties. Sotheby’s International Realty® affiliates franchise is granted only to diligently chosen real estate agencies and individual brokers, who conform to highest quality standards. Sotheby’s International Realty Affiliates LLC provides franchisees wide range of business management, marketing, recruiting, training and business development tools. Agencies involved in the network are provided the opportunity to cooperate with the honorable Sotheby’s Auction house within the respective market. The worldwide well – known auction house Sotheby’s was founded in 1744 in London. In 1983Sotheby’s was bought by the US led consortium of companies and Sotheby’s was listed on the New York Stock Exchange in 1988. 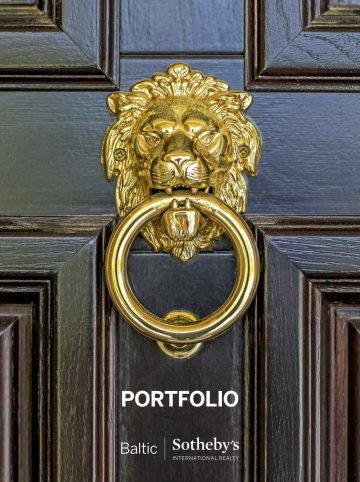 The Portfolio catalogue is an individual Baltic Sotheby’s International Realty real estate magazine, which advertises luxury and exclusive properties in Lithuania.